Pliny the Younger, who wrote that the ghost of an old man was haunting his house, recorded one of the first ghost stories in the first century A.D. In AD 856, the first poltergeist haunting was reported in Germany. This year put a new twist on your traditional Halloween party by giving it a “Ghost Story” theme. Here are some easy ways to get started. 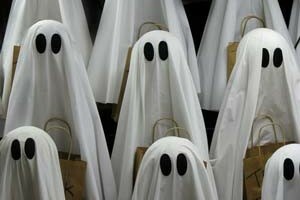 You can’t have a ghost story party without ghosts. To make sure you have plenty of eerie ghosts and spooks around, encourage all your guests to dress the part. Let them know that “ghost attire” is required, but leave the rest up to them. You’ll get a wide variety of spooky specters – and probably some friendly ones, too (think Casper) – to get everyone in the “spirit” of the party. If you’re outside, start a bonfire. If you’re inside, dim the lights to create the perfect atmosphere. For safety, and for a bit of extra spookiness, hand out flashlights or glow sticks as party favors. Encourage storytellers to shine the lights below their faces as they speak to create an extra-spooky look. 1) Make it a requirement that everyone has to come to the party equipped with at least one good ghost story and ready to share with the group. 2) Put “story starts” on scraps of paper and have everyone draw one. Give each person 5 minutes to tell a ghost story starting with the phrase on his or her piece of paper. 3) Tell “tag team stories” where one person starts a story and the next person adds to it, and so on. Set a 2-minute (or 5-minute or 10-minute) timer each time the story is passed, so each person gets the same amount of time to speak. With these fun ideas, and some of your own, you’ll be able to create a “spooktacular” “Ghost Story” Halloween party your guests will love.